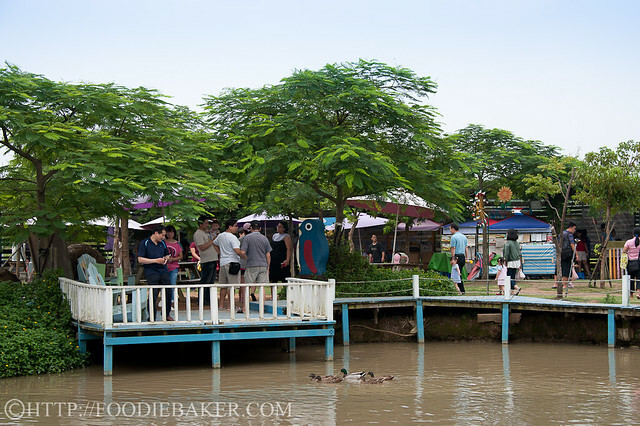 I’m back, and am finally blogging about my Taiwan trip! For now, let’s head back to the farm! Sunflowers standing tall after the “attack” from Typhoon Saola the previous day. 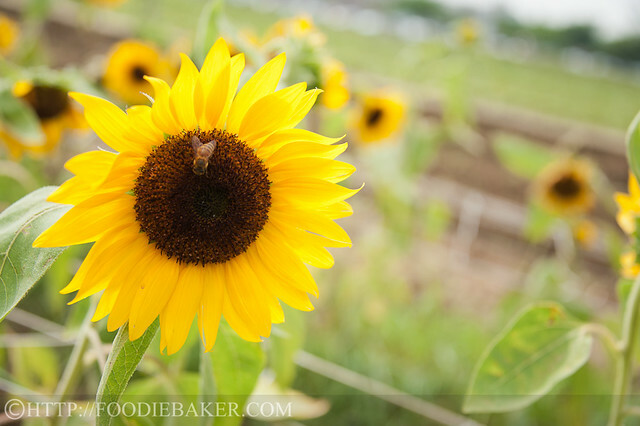 Sunflower is my favourite flower (so bright and cheerful!) 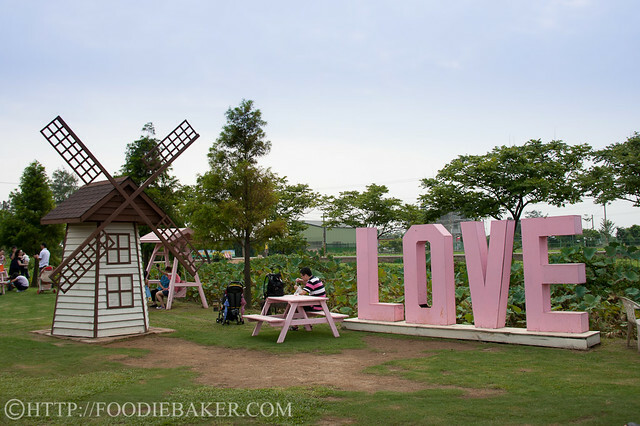 and I’ve always wanted to visit a sunflower farm, so Sun & Green Leisure Farm was the first place that we head to upon reaching Taiwan (because it’s located pretty near to the airport). We took a cab from the airport (Taiwan Taoyuan International Airport) to the farm – it was a little hard to find, but there were plenty of signs indicating which way you should go when you’re nearing the farm. It was amazing, being greeted by a field of sunflowers! 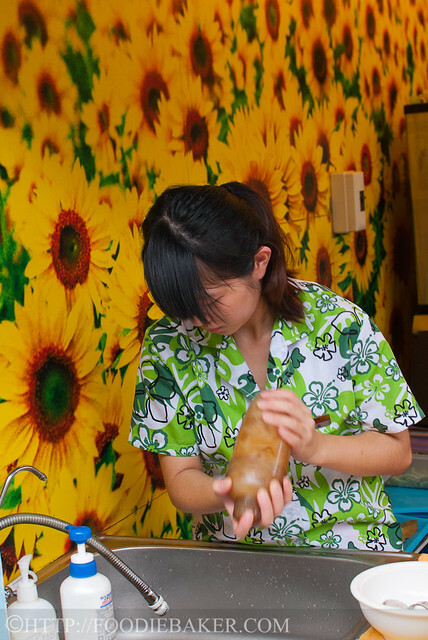 At more than 59,000 square metres (more than 635,000 square foot; about 6 hectares), Sun & Green Farm is the largest sunflower farm in Northern Taiwan. Sunflowers commonly grow to heights between 1.5 metres to 3.5 metres (5 to 12 feet). However, the owner (I think only 28 years old or early 30s) of the farm has successfully breed sunflowers that reaches only to our waist (or shorter than that), making it easy for people to bring home the sunflowers. 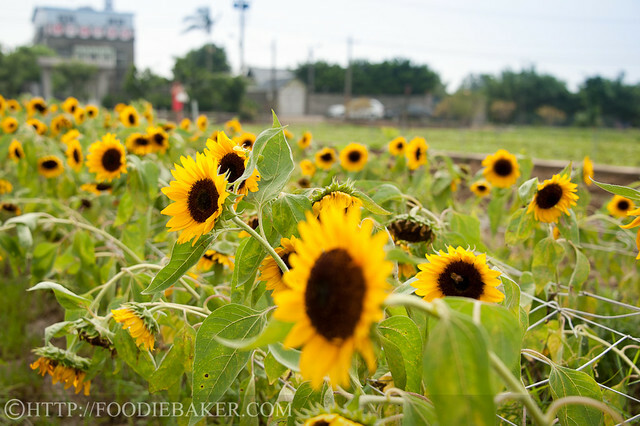 The sunflowers are very pretty, but I wish to go to a farm in the future where the sunflowers are as tall as me! Besides the sunflower fields, there are also some benches and tables on fields for family gatherings. A pond for people to feed the ducks. 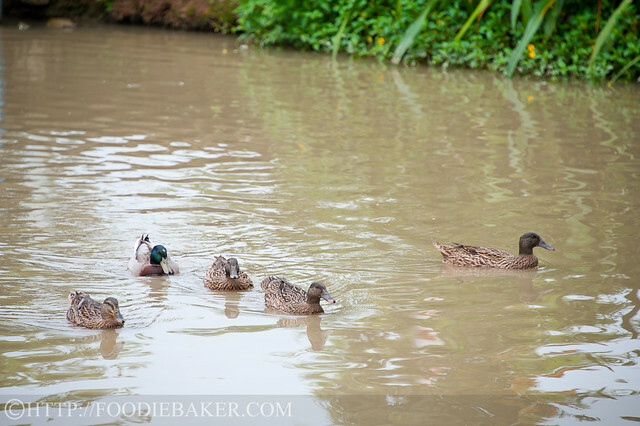 Happy ducks swimming around, waiting for people to feed them. They’re so happy-go-lucky and carefree looking! There are also mini animal farms at the Sun & Green Leisure Farm where goats and rabbits were kept. Animal feed can be bought to feed them. 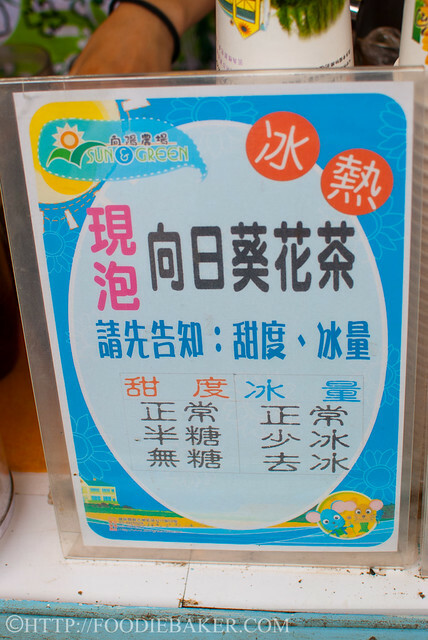 A speciality the farm sells is the Sunflower Tea (NT50). 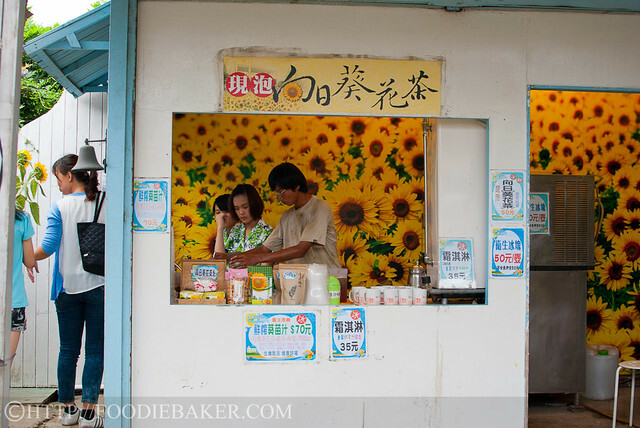 There’s a small shop just next to the sunflower fields. Comes in cold or hot, you can customize the drink by choosing the amount of sweetness and ice (normal, 50% or none). 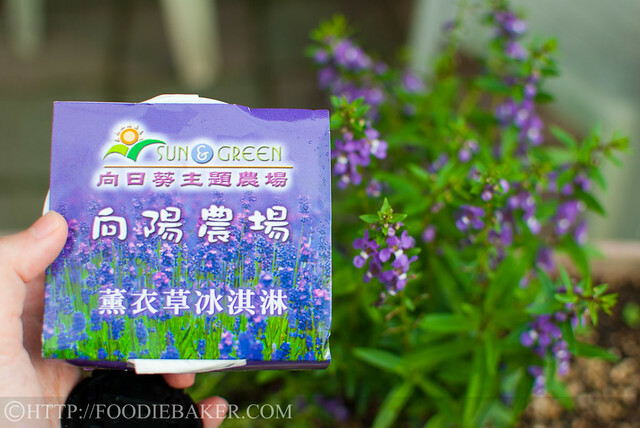 We chose 50% sweetness and 50% ice – it was extremely thirst quenching but the taste didn’t wow us (tasted a little like chrysanthemum tea to me). There’s also a souvenir shop where we came out almost empty-handed, except for a tub of ice cream. 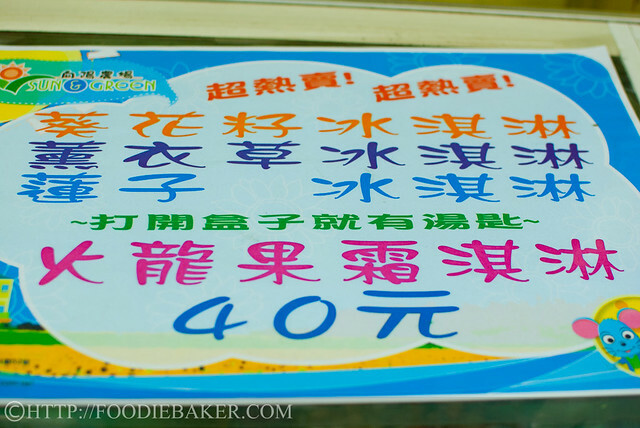 There are 4 flavours available: sunflower (wonder how it’ll taste…), lavender, lotus and dragon fruit. The flavour is pretty subtle, not really my type of ice cream, but a great treat for such hot weather! And here are the details of the farm! Opening hours 9am – 6pm (closed on Mondays)They grow different types of sunflowers and other flowers during different seasons, so you can visit the farm all year round! The ride is about 45 minutes to 1 hour. You can also get the driver’s phone number so that you can call him to pick you up later. The people at the farm are very nice, we managed to leave our luggage at the souvenir shop while we walk around the farm. Take a HSR (High Speed Rail) from Taipei to Taoyuan for NT155 per person (20 minutes train ride). Get a cab from Taoyuan HSR and cab down to the place. The bus goes from (Jhongli – Sinpo – Guanyin). Alight at TECO Electric shop and take a cab to the farm (unless you want to walk 40 minutes to get there). It was a great disappointment! The farm has only a few large sunflowers ( some were almost dried up) left. Later I was informed that you can pick the sunflowers but at a price. There were hardly anything for visitors like me. The ice-cream wasn’t nice. The sunflower tea was a disappointment! Going back was so difficult for us. We took a bus to this farm. My suggestions are , please provide free transport to your farm. Also, have some food/lunch ready. I found out that I could not buy anything because there is nothing to buy (to have my lunch). Thank you. I love sunflowers! And what a view, a field of sunflowers! I once saw an extremely huge sunflower plant, as tall as me and the flower bigger than my face, in Cameron Highlands, that was decades ago, and sadly I do not see it anymore. 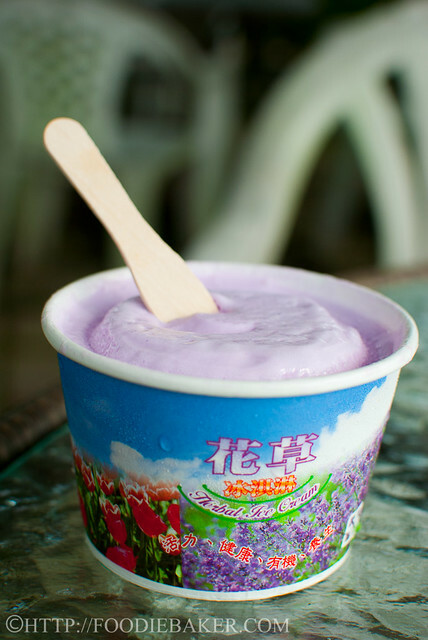 Lavender ice cream sounds great! I have not been to Taiwan, well, hopefully one day soon! It was just a year ago that I have visited Taiwan too but with my little boy, we had not gone any place far off Taipei. 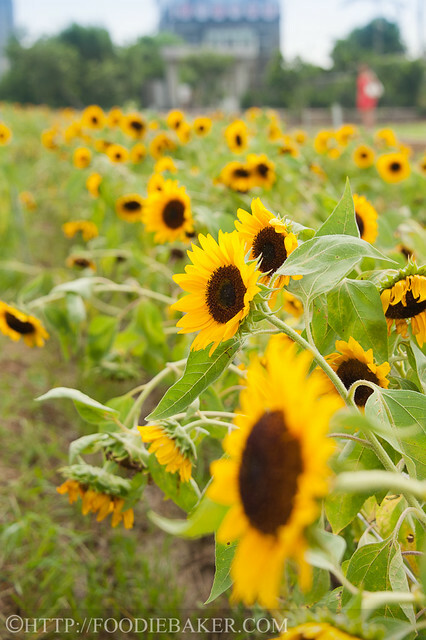 This sunflower farm looks very pretty… Indeed a very nice place to visit. I loved the pictures of those fields of sunflowers although I’m more familiar with the tall (5″ plus) ones here in Ontario, Canada. And I would have loved to try all 4 of those ice cream flavours … maybe not the lavender but the dragonfruit sounds intriguing.